Crash (1996), Weekend On The Rocks (2005), Live Trax Vol. 3: Hartford, CT August 27, 2000 (this album) (2005), Live Trax Vol. 4: Richmond, VA April 30, 1996 (2005), Live Trax Vol. 7: Hampton, VA December 31, 1996 (2006), Live Trax Vol. 6: Boston, MA July 7-8, 2006 (2006), Live Trax Vol. 9: Las Vegas, NV March 23-24, 2007 (2007), Live Trax Vol. 16: Cincinnati, OH June 26, 2000 (2009), Live Trax Vol. 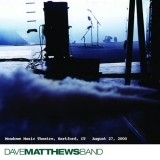 17: Mountain View, CA July 6, 1997 (2010), Live Trax Vol. 18: Virginia Beach, VA June 4, 1996 (2010).